Also known as the Blue Heeler, the Australian Cattle Dog is a tough and hardworking dog that can cover immense distances. Considered a fearless and determined working dog, they are also versatile in herding and can work with horses, goats or even ducks. Today’s intelligent, independent and stubborn breed came from combining Dalmatians, wild Dingos, Collies and other breeds to the ideal Australian Cattle Dog or AuCaDo. These dogs are often a one-person dog that will be eternally loyal, gentle and alert for their owner but rather aloof with strangers. They are easygoing with people they know, easy to train and get along with children although they may try to herd them. AuCaDo puppies are born all white with coat coloring appearing several weeks after birth. Their smooth double coat coloring is predominantly blue variations including blue mottled, blue speckled or red with or without black, blue or tan markings on the head. They grow to become muscular, medium-sized dogs that have a quick gallop and quiet temperament. 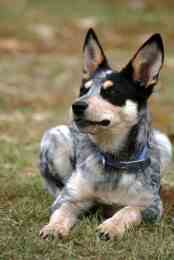 The Australian Cattle Dog is sturdy, strong and compact with almond shaped eyes and a long brush tail. With naturally pricked ears, they are agile and intense dogs, making them excellent herders.